Lake George, NY is both a lively village set amid the beauty of the Adirondack Mountains and a beautiful 32-mile lake fed by cool, clear underground springs. The lake is considered one of the most beautiful in the world and is dotted with over 300 islands. Many miles of its shoreline are classified as "forever wild," with terrain ranging from quiet and secluded sandy beaches to rocky crags dramatically towering over the water's edge. If you will be staying in Albany for more than a couple of days, a day trip north to the southern Adirondacks and Lake George is highly recommended. A short hour's drive up I-87 will bring you to Lake George, NY - a fun and bustling community that is bursting with activity, particularly during spring, summer and fall. Prospect Mountain beckons on the horizon and can be reached on foot via a short, steep hike, or by a leisurely drive up a well-maintained road. Enjoy the breathtaking view from the top as you plan the rest of your day's adventures. Back down in the Village, you can soak up the sun on the beach and take a dip in the cool refreshing water. If you're looking for on water activities, you have your choice of several marinas for boating, parasailing or skimming the waves. 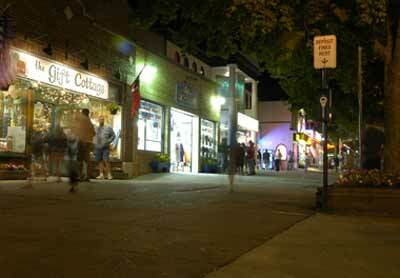 Stroll down Canada Street and shop the eclectic row of souvenir and gift shops. A bit south from the Village is the Great Escape theme park, which offers thrills and screams on over 100 rides and attractions, as well as an adjacent water park. Continuing south on Route 9 you'll encounter more shopping with the popular "Million Dollar Half Mile" - a collection of over 80 name-brand factory outlet stores. Ready to slow down? Take a leisurely sunset or dinner cruise on Lake George as you sip champagne and listen to a jazz trio. Visit one of the many fine restaurants or casual dining spots for a relaxing and memorable meal. And if your timing is right, you may just catch the weekly fireworks that bring hundreds by boat, motorcycle, car and foot to catch a spectacular display of sights and sounds. Afterwards, stroll along the promenade by the water's edge as music drifts softly on the breeze from open air decks of the nightlife. Not ready to go home? Arcades and several miniature golf courses are bustling with activity throughout the evening. Ready to do some dancing? Lake George Village offers a variety of nightclubs and entertainment options ranging from solo acoustic stylings to the thumping bass of a disco beat. Decide you want to come back to Lake George and stay while? Both the Village and surrounding communities abound with hotels, motels, inns, cottages and condos to suit every taste and every budget.